For a number of years now I have had the privilege of traveling the globe while working with some amazing individuals to provide security assessments and training. In recent years, this work has evolved from performing standard security assessments, forensics and pentesting to focusing on security within the virtual environment. I was introduced to the VMware Hypervisor and it various products by Tim Pierson, a cloud security expert out of Dallas, TX. Working with virtualization has proven to be very enjoyable; however there is always a downside. Many owners, managers and administrators often ignore the need to assess the security of their VMware vSphere environments. Since virtualization is normally implemented in the internal network, the level of risk has been considered low and the security around the Hypervisor and vCenter have been terribly overlooked! Working with VMTraining to develop courseware to help us understand the risks that are inherent within this environment has been a real privilege and I have enjoyed being on the cutting edge of a technology that has taken over the world! We are making certain assumptions while writing this article. For example, we will not go into what VMware vSphere, Hypervisor or vCenter is or does and we expect that you will have a general working knowledge of the VMware environment in order to understand the topics we will be explaining and demonstrating within this article. We are going to start this article by discussing a few of the reasons why virtual architecture should be viewed as yet another layer within an environment that contributes to the environment’s overall attack surface. First of all, the virtualization software is the underlying bedrock of the virtualized environment. All virtual servers are dependent upon it and when access is gained to management interfaces, the entire infrastructure can be owned. We all understand that virtualization can be deployed in many different ways ranging from a simple design to more robust and complex architectures. Regardless of the complexity of the deployment, they all have threats that must be assessed. I have seen best of breed deployments where most every threat has been covered and I have also seen deployments exposed to the web which are easy to access by anyone. Take, for example, the use of Shodan at http://www.shodanhq.com. If you are not familiar with this website, you should spend some time gaining an understanding of the capabilities behind this impressive system. A simple explanation is that it is a server search engine. Look Familiar? I think they are asking us to exploit their weak security posture! Ok, that is illegal so please do nothing more than look! There are hundreds of threats related to the overall VMware environment ranging from attacks on the hypervisor, vCenter, Update Manager, Data Recovery and many others. I would like you to notice the results of the attacks directly against an ESXi 4.x host in Figure 4. When looking at the statistics from Secunia, we can see that the top 2 results are System access and DoS! 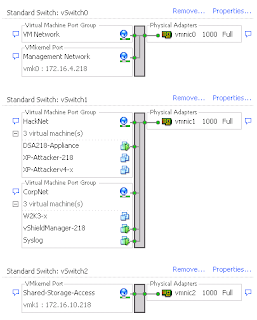 System access on an ESXi host that will allow an attacker to access everything on the box! What about vCenter? See Figures 5 and 6. 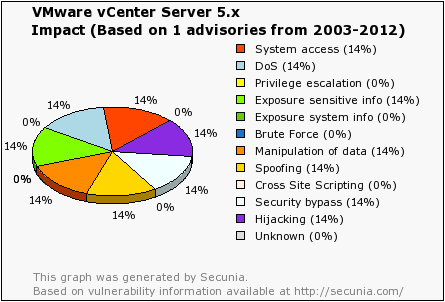 As you can see, the devastation of attacks against vCenter is significant. Keep in mind that the worst credit card heist in known history, the Gonzalez indictment, occurred from 2006-2008 in a virtualized environment! The attack was performed against systems that were running on ESX. In the end, the attackers placed a rootkit on the ESX host that captured credit card information traveling through the host memory and CPU. In other words, they captured the traffic for many of the SQL servers at one time which resulted in 140 to 180 million cards stolen! This incident alone should alert us to the need for hardening our virtual environments. What are some of the most common mistakes made when deploying VMware vSphere? The most frequent and critical error is a lack of network segmentation to separate the management servers from the rest of the common network. Figure 7 is a screenshot of a classroom network used to demonstrate the commonly used methods for deploying a virtual network. Take note: there is no use of VLAN’s. In this environment, a virtual machine will have access to all of the other systems on the network. This is not how things should be done! Even when we have a segmented management network with the use of VLAN’s and vShield zones, there is still a common mistake! How is the vCenter Administrator accessing the management network? This is the common breakdown in the environment. It has amazed me how many companies ignore common security practices within the virtual deployment. They harden the network and windows servers but ignore the virtual. How many companies are logging onto the Hypervisor with root and a common password known by every user? WHAT, are you kidding me? Unfortunately, this is more common than not, even though it flies in the face of every compliance policy ever written! The rest of this article will look at how to exploit the vSphere environment using Metasploit as the framework. The July 2012 Pentest Magazine had an article titled “Working with Exploitation Frameworks Metasploit” in which it was mentioned that many pentesters do not take full advantage of the additional functionality of Metasploit. We will be using auxiliary modules that were created and then added to the Metasploit framework along with existing built in modules. Some of the best modules in the industry used to directly attack a vSphere environment were created by Claudio Criscione and his team! Claudio’s research and development has been amazing, providing us with simple to use exploits that help us to maximize our exploitation success. One of the auxiliary modules allows us to download virtual machines directly from an ESX 3.5 host with no credentials. My personal favorite is the exploit that allows you to steal the SOAP ID of an existing vCenter 4.x administrator and then ride the admin’s session! No need for anything but access to vCenter!! It is time to take a look at using the Metasploit Framework auxiliary modules to scan and exploit the vSphere environment. All of the following demonstrations were provided by a colleague of mine, Vincent Hautot. Vincent is a highly skilled Pentester and trainer with Sysdream (http://www.sysdream.com/) of Paris, France. Sysdream is the go-to organization for anything security in France! They are the founders of hackerzvoice (http://www.hackerzvoice.net/) and hacker’s night (http://www.nuitduhack.com/en) which is an amazing conference that has continued to grow each year! Thank you Vincent for your contribution to the article. The first two demonstrations from Vincent use modules provided in the Metasploit Framework 4.2. Make sure to update your framework with svn up in order to verify that you have the correct modules. servers and attempts to identify version information for that server. The results below have identified the host correctly and now we know exactly what we are attacking! Now that we have identified the host and version, we can look at possible means of exploitation. There are many options; however we are going to stick with the tried and true method of using Metasploit to Bruteforce the ESXi login! Metasploit has provided a module to bruteforce the local account. This module will use a dictionary attack and you will need a dictionary file. The file can be your own or you can use the built-in file from Metasploit found at $METASPLOIT_HOME/data/wordlist/. Now let’s run this baby and see what we can find! We have found valid username and password. We should apply a correct password policy. Just as you may expect, Metasploit makes this too easy for us! This is what it is all about, making our job easier. We simply want to test the environment. Remember, a properly configured system would not allow this attack to occur. For one, it should be segmented although even if Vincent was part of the management network he would not be able to perform this attack if the Lockdown mode was enabled on each host! If you are concerned about having issues due to vCenter losing connection to the host, there is no need. 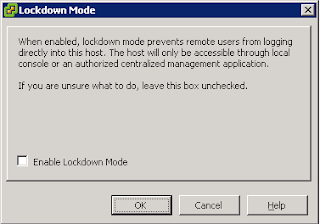 You can enable/disable Lockdown Mode from the DCUI as well as within vCenter. Cool - now we own your box since lockdown mode is turned off! We will move on and look at one of the many modules provided to you in VASTO. Vincent has chosen to attack the vSphere administrator directly by using a MiTM attack that circumvents the standard communication with the vSphere Client. In this demonstration we will be using the VASTO auxiliary module called viluker. The reason this attack will work is due to the communication process from the vSphere client to the vCenter or Host. The vSphere Client will ask for the host or vCenter “What is the latest version of the vSphere Client?” If a newer version of the client software is available, the client will be told where to download it and can update on the fly. Now that we are intercepting and routing the traffic properly, we can run the vilurker exploit. LHOST no The local IP address to listen to. LPORT no The local port. PAYLOAD windows/meterpreter/bind_tcp yes The payload to run against the client. RHOST 192.168.130.95 no The remote host. RPORT no The remote port. SRVPORT 443 yes The local port to listen on. Did you notice the payload? Yes, we are utilizing the famous Meterpreter to take advantage of the Windows OS. There are a few settings we need to establish before launching the exploit. We chose to use reverse TCP rather than the bind method. With the reverse TCP method, we are telling the victim to connect to the attacker rather than just leaving a port open for the attacker to connect to the victim. Now that all of the settings are established and we have the exploit running, we sit and wait for the administrator to connect! That is easy! Below you will see that a connection has been established and the vSphere client is asking for the clients.xml file. The auxiliary module providing this on our behalf! This, of course, is just one example out of many when testing the security posture of the virtual environment. When looking at methods to prevent this type of attack you would normally consider how administrators connect to the virtual infrastructure, what path is being used and what other devices are on the same network. If you cannot provide the level of segmentation required to secure the internal network, as administrators you must at least be mindful of any updates you have applied to vCenter or the host. 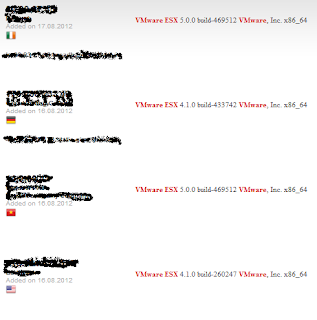 Any updates from VMware will provide documentation regarding what is updated and the vSphere client would be listed. 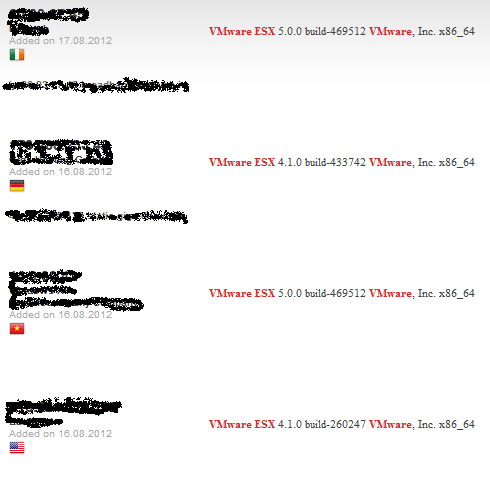 If there has not been any update to the vSphere client, you should never receive the upgrade notice. This article provides just enough information to get you started. 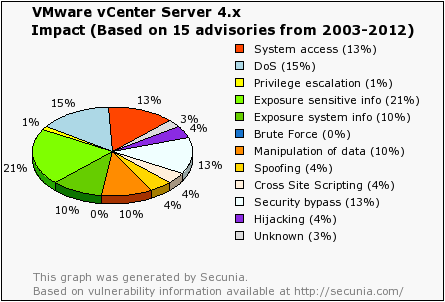 Take the time to look over the other exploits developed to attack vSphere. If you develop some on your own, please share them with the rest of the world so we can all create a more secure future! We have only demonstrated some of the attacks available when using Metasploit, however there are many other tools available to us when working in this environment. NMAP has a complete set of testing requirements to identify vCenter or ESXi and ESX. We also make use of Cain and Abel and many other scanning tools on the market for verification purposes. One thing we all need to remember is chained exploits! In today’s environments, the one and done hacks no longer work and we need to chain together multiple hacks to get what we are after. Hacking the virtual environment is no different. VMtraining and Sysdream (Duane and Vincent) would like to thank you for taking the time to learn a little bit more about security in the virtual environment. There is so much more we would like to share with you, but that would require Vincent and I to write an entire book. I am not sure either of us has the time. However you can attend one of our 5 day classes offered at Sysdream or anywhere in the globe you can find the VMTraining classes. We look forward to meeting you one day. Thanks for this great article, do you know when we will be able to gain access to the tools in Metasploit?